Online Recipes…How’d She Do That? I’ve been looking up recipes on the internet a lot lately, and I’ve noticed a few things. They all look very similar with their multi-font graphic for Pinterest, the recipe format within the blog, the nutrition label, and the print recipe function. A lot of these bloggers don’t strike me as super technical, so I figured there must be easy-to-use tools. It turns out there is a WordPress plugin for nearly everything. I did a quick search on “WordPress recipe plugins” and came up with quite a few to choose from. My needs are simple: easy to use, recently updated, nice recipe output, and free. I narrowed my choices down to WP Recipe Maker and Zip Recipes. My Honey Nut Granola recipe is created with WP Recipe Maker. I will install Zip Recipes and compare at some point. I just went with WP Recipe Maker because it had more installs, was recently updated (that day), and had good documentation and support. I think the free version did a decent job with my recipe. To get nutrition information included in my recipe, I need to upgrade to the premium version of WP Recipe Maker. Instead, I opted to find a nutrition label generator. I used the VeryWellFit Recipe Nutrition Calculator. You just paste in your recipe ingredients and it generates a nutrition label graphic. I think I will do some more research in this area, but it was a good start. And finally, we come to those pretty multi-font graphics. Another quick search and I discover everyone ( everyone that’s not a graphic artist) is using a free site called Canva to create their stunning graphics. They too have a premium version, but I got what I needed for free. Now I just need to work on artsy food photography. I don’t think there’s an app or plugin for that. When you live far enough away from town that you have to cart your trash to the dumpsters a couple miles down the highway and it’s almost a mile to your mailbox, communications technology can be a challenge. So today, instead of the usual house projects and gratuitous pictures from my deck, I’ll be talking about communications tech. Our top priority after buying the house was Internet connectivity. There are a few options: satellite, fixed wireless, and cable. The satellite company is Hughs.net which has terrible reviews; the cable is Frontier which I had in Elk Grove and despised; so that left Red Spectrum fixed wireless. Here is the giant antenna attached beneath the deck. It brings us 25 Mbps of happiness. When we moved, we decided to break free from the landline and just use our cell phones (how millennial of us). Unfortunately, there were only two spots in the house where we could make and receive calls. Minor movements like sitting, standing, or breathing would drop a call. The solution to this problem is a cell signal booster which entails a few pieces of equipment and some really fat cables (so much for wireless). Now we can happily make calls from anywhere in the house and not worry about moving about too much. This is not the indoor antenna’s permanent location. It will be mounted on a wall once we figure out the best spot. Today’s addition to contraptions mounted under the deck is an HD TV antenna. This is supposed to deliver us free HD TV channels such as the major networks and PBS. So far, all we have are two PBS channels. We need to do a bit more adjusting to get the antenna aligned with the broadcasting towers. We have survived without TV for a month, so another day shouldn’t be too rough. These next two pieces of technology aren’t communications related, but they are kind of cool. You may have noticed the Litter-Robot in a previous post. It happily sits in the laundry room and makes our life with cats that much sweeter. Unlike our previous automated litter box, this one does not entail washing and drying plastic cat litter pellets and all the headaches that go with plumbing. The Litter-Robot waits until the cat has exited and slowly spins to sift the clumps, dropping them into a concealed compartment. Sophie likes to watch it like TV. Since we are reflooring the whole house in vinyl, I decided to research robotic vacuums. After tracking in all the lovely Idaho dirt all day, it will be nice to have the floors swept daily. My bobSweep is on order, but I am looking forward to his arrival. Today’s blog is all about weather. We woke up to a beautiful, clear, sunny morning. We drove into Coeur d’Alene for breakfast, and it was cloudy and overcast. We’ve noticed a few times that when it is sunny at our place it is dismal in CDA. We checked out the touristy area of CDA. Lots of ritzy shops and restaurants. Then it was off to Home Depot because we can’t go there often enough. Among other things, Shawn was in search of hardware to mount my new weather station. Yes, I have a weather station. For some reason, I am fascinated by the weather and have always been a diligent follower of the weather report on the news. I have at least five weather apps on my phone and tablet. My latest weather find is Weather Underground which lets me track specific weather stations. This is also where I learned I could get my own personal weather station and report my data back to Weather Underground. There are so many choices when it comes to weather stations, but I decided to start with an entry level station by Acurite for under $200. One day I might advance to the next level and start tracking lightning and soil temps. My model will track temperature, wind speed and direction, humidity, dew point, and rain. The National Weather Service suggests a height of 33′ for the weather station for optimal readings, and Shawn managed to rig a 3-piece metal pole to get mine up to 28′. It looks pretty impressive way up there. The weather today was a bit of everything. We had sun, clouds, hail, snow, wind, and back to sun all within a few hours. We’re told if you don’t like the weather wait 15 minutes and it will change. That was definitely the theme today. I’ve learned about a few websites and apps that make travel planning easier. We used Expedia and Bookings.com to make all our hotel reservations. Strangely, they did not always have the same accommodations available, and if they did they were not always the same price. We ended up using Expedia for the majority of our reservations. This is nice because it makes an itinerary for your whole trip. Both apps show lots of pictures of the properties and you can narrow your choices by price, ratings, and amenities. If you use Gmail and Google Calendar, Google will helpfully read your email and put all your reservations on your calendar. This was very handy because with a glance at my calendar I realized I had double booked one day and didn’t have a place to stay the next day. Tripit is another app that will read your email and add all your hotel, flights and rental car reservations to an itinerary. You can also add other activities (like a scuba dive and dinner at Hobbiton) to your itinerary. Great for keeping everything in one place. While on your trip you can add photos to each day too. I think that will be handy for remembering when, where and what we saw. For mapping our adventure, I found a great article on how to use the Google map engine to make your own custom map. I dropped all our lodgings on the map and then Google calculated the routes. 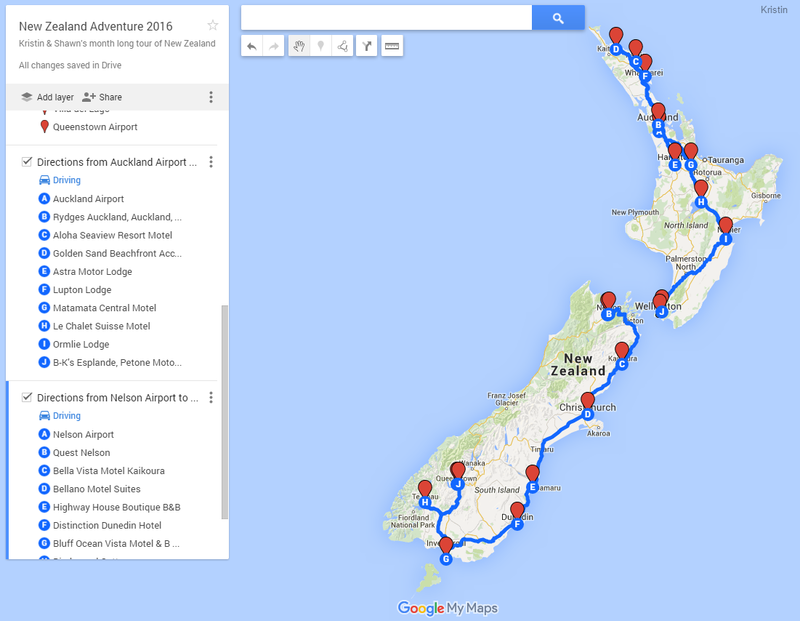 Assuming all goes as planned, we will be driving about 1200 miles on the North Island and 900 miles on the South Island. Good thing Shawn loaded up the iPod with tunes. Shawn also found a used GPS on eBay with New Zealand maps installed. We paid about $80 for it and can probably resell it when we get home and recoup our investment. This was much cheaper than adding a GPS to our rental car. Shawn has also pre-loaded all our destination addresses into the GPS so we’re ready to hit the road. I love technology, but I’ve heard Internet performance in New Zealand is a bit slower than what we’re used to. Oh well…its vacation and we’re not in a rush.